When my wife Ellen and I had our house appraised recently, I complained to the appraiser that the current appraisal figure was $20,000 lower than the one done three years earlier (before we made some very visible major improvements). Once I had a chance to think about it, the appraiser's response seemed right. He told me this 'minor downward adjustment,' as he called it, was actually good news. Such a small [!] decline in the valuation, he explained, showed that our property had held its value during a time of catastrophic losses in so-called better neighborhoods on Staten Island and elsewhere. He added that, in general, houses in our area were holding their value (a) because of their close-to-Manhattan location; and (b) because, even at the height of the real estate bubble, their selling prices usually were lower than elsewhere on the island and closer to their underlying value. The meaning of our appraisal runs exactly counter to the findings of a poorly researched May 15 New York Times story about a slowdown in St. George's resurgence by City Room reporter Christine Haughney. Haughney noticed (or was told about) Brooklyn developer Leib Puretz's unsold condos. She interviewed Karl Reina, the Karl's Klipper restaurant's owner, and heard about its dwindling income. On the basis of those two examples, Haughney concluded that St. George's resurgence has, as she put it, stalled. Nonsense. Leib Puretz's condos are unsold because they're overpriced. They were overpriced and unsold during the housing bubble; they're overpriced and unsold now. Karl's Klipper's income is falling because those who can afford to eat out in this economy prefer the more interesting experiences offered by local restaurants like Enoteca Maria, Beso, Bayou and Adobe Blues. Ms. Haughney wasn't told about my new neighbors across the street--the ones who waited until the price of their new house fell to a level they could afford, then made their bid. She probably didn't hear about the new couple down the block, either. Both teachers, they bought a bank foreclosure after the former Section 8 tenants vandalized the property and the absentee owner jumped ship. Last weekend, they were out there, planting a sidewalk perennial garden. What's more resurgent than that? 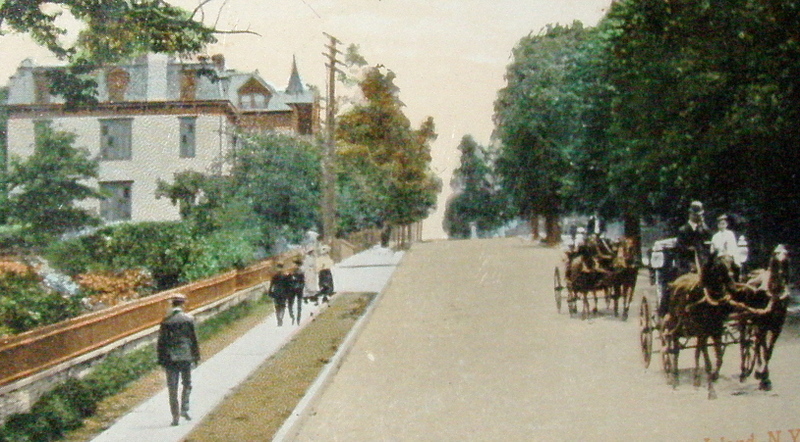 NOT HOT: Postcard view (dated 1910) looking south on Westervelt Avenue from Richmond Terrace, St. George, Staten Island. Because this hasn't been a hot neighborhood for slightly more than a century, every building shown in this image is still intact and in a moderately good state of preservation. A portion of our house is shown in the upper left section of the image (notice the double-windowed gable and the spire to its right). Despite the sneering disdain of metro journalists who pay two grand a month for a closet in a renovated tenement on Avenue C and Houston Street, it's possible to live where they wouldn't be caught dead and actually like it. On Staten Island, I mean. Specifically, in one of the older neighborhoods on the north shore, near the ferry. After a while, the plucked-from-the-Midwest streetscapes of Staten Island's north shore stop looking quite as foreign as they did. It starts to seem normal to be able to see the sky without craning your neck. Or to be the only person walking down the street, utterly alone with your thoughts, and not feeling in the least unsafe. You even get used to the quiet. Don't get me wrong now. Staten Island is hardly Valhalla. We live in a place everybody's heard of but very few actually know--a place routinely overlooked, underserved and dismissed. But there are times when going unnoticed, unacknowledged and underrepresented pays off. Leaving Manhattan for places like New Brighton, St. George, Tompkinsville and Stapleton gets you twice the space for half the price, give or take a hundred or two. And maybe a view, a garden or a fireplace as well. There's always a seat on the FREE Staten Island Ferry. Always a chair at the barber's. Always a table at a decent restaurant; no reservations required. At public parks, even on the weekend, it can often seem like everybody's left town. Though the north shore's hilly streets are challenging for cyclists, they're one of the best non-park environments I've found so far as a walker. My neighbor Martha, who moved to St. George from Battery Park City with her husband and two children, is hyper-alert for signs of gentrification hereabouts. She winces whenever she sees positive media coverage of our area, which she's certain can mean only one thing: She and her family, having found a pleasant place to live they can afford, will be forced out by high rents once again. Given the national economic downturn and the shaky state of real estate everywhere, including Manhattan, I don't think Martha has a lot to worry about for the forseeable.